Our wavefront refraction technology has the ability to detect early signs of cataract development. In this case, we demonstrate how our optometrists/ophthalmologists use Smart Vision Labs’ telemedicine platform to detect signs of early-stage cataracts and send for a comprehensive cataract referral. The patient is an elderly gentleman visiting one of SVL’s partner eyewear retail locations during March, 2018. Patient went through the wavefront refraction test, and the data was reviewed by a licensed ophthalmologist. The doctor referred the patient for cataract evaluation. There are 3 data points standing out about the patient. Patient age is 75 years old, in the high possibility zone of developing cataracts. Patient’s unaided Visual Acuity for both eyes is 20/200. The wavefront images for both OD and OS show symptoms of light blockage in lens pathway; indicated by the red circles. How the SVOne is detecting Anisometropia & Keratoconus with remote Wavefront Aberrometry. SVOne wavefront refraction technology has the ability to detect signs of Keratoconus and Anisometropia. In this case, we demonstrate how our optometrists/ophthalmologists use Smart Vision Labs’ telemedicine platform to detect signs of Anisometropia and send the patient for a comprehensive eye exam referral. The patient is a younger person in her twenties visiting one of SVL’s partner eyewear retail locations during December, 2017. 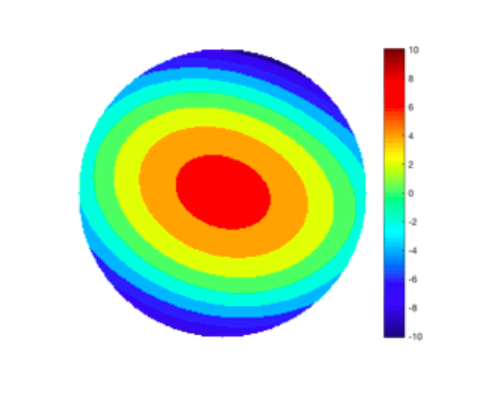 Patient went through the wavefront refraction test, and the data was reviewed by a license optometrist. The doctor referred the patient for Anisometropia evaluation. There are 3 data points standing out about the patient. OS has significant higher cylinder term than that of OD. Both Keratoconus and Anisometropia are possibilities to explain the high cylinder in OS. After reviewing OS wavefront map, doctor didn’t find significant coma in OS. Doctor referred the patient for Anisometropia evaluation. We recently held a webinar with optometrist Dr. Tihomira on how to incorporate telemedicine into your optometry practice. Dr. Tihomira is a leading optometrist who embraced telemedicine and is influencing the technology development. One of the main topics she discussed was how automated refraction and telemedicine technologies are challenging the gold standard of subjective refraction. Subjective refraction is widely accepted as the optimal refraction method in the industry, despite how variable the process can be. So if subjective refraction is not necessarily the most repeatable method, why is it still considered to be the best way to determine someone’s prescription? The use of a manual phoropter to conduct a subjective refraction continues to be considered the gold standard in the industry. The question is why? This process is influenced by multiple factors including; the ambient lighting of the room, the quality of the projections system, the cognitive awareness of the doctor and the patient during the process, and both the doctor’s and patient’s previous experience with refraction. All these factors play a role in the determination of the final prescription and the accuracy of that prescription. Doctors try to control as many variables as possible but ultimately refraction remains a very variable process. A clinical study published by Bullimore illustrates the variability of subjective refraction. The study compared refractions done on the same patient by two separate clinicians and found that, for sphere, the 95% limit of agreement varied from -0.9 D to +0.6D. The study also reported that automated refraction is more repeatable than subjective refraction. 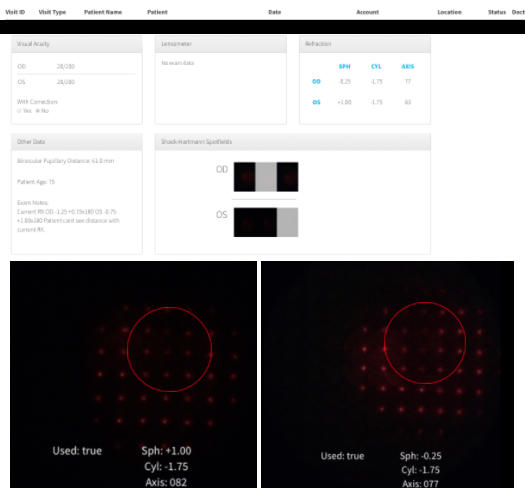 Wavefront aberrometry is challenging this gold standard of subjective refraction due to the repeatability of its results. When measuring the visual performance the technology assesses two components of the visual system: the optics that form the retinal image and the neural processing that transforms the retinal image into perception. Subjective refraction has historically been unique among methods of refraction. In considering both components in asking the observer to choose between a series of options, the goal is to optimize visual acuity. However, wavefront aberrometry together with visual image quality metrics are changing the old model. A study published this year by Hastings et al. showed that 72% of patients preferred prescriptions generated using wavefront aberrometry optimized by visual image quality matrix, compared to prescriptions generated by subjective refraction. The SVOne autorefractor will include wavefront aberrometry in September of 2017. The SVOne autorefractor uses Shack-Hartmann wavefront autorefraction to capture 3 images per eye, taking 3 seconds per eye. Through the analysis of up to 120 points, a Zernike decomposition algorithm extracts the low order aberrations and converts them to sphere, cylinder, and axis. There are several unique features of the instrument, one of them is a least-squares reconstructor algorithm that adapts to pupil size on the fly. The device also features an open field design with machine learning algorithm allowing the system to – as soon as optimal pupil alignment is achieved – autocapture the measurements, thus eliminating proximal cues and limiting accommodation. The SVOne is capable of measuring a wide range of refractive error, from -14 D to +14 D sphere, up to -7 D cylinder in 0.01D increments and axis measurements in increments of one degree. As you can appreciate from the image shown here, the device is very small, nothing like the autorefractor you are likely to find in most optometric offices. Additionally, it weighs less than 1 pound. To make the transfer of data easy, the device has the capability to store data in a HIPAA compliant cloud platform that can send data to your EMR. Clinical study data has been able to highlight the accuracy of the SVOne autorefractor. A study published by Ciufreda et al. in 2015 showed that SVOne refraction is accurate and has higher repeatability than subjective refraction. The study was conducted using 50 normal adults age 18 to 34, all correctable to normal vision. For all subjects retinoscopy, SVOne refraction and subjective refraction were determined and the difference between each of the findings and subjective refraction were quantified using the 95% limit of agreement. The table above shows the values calculated for the 95% LOA in diopters for retinoscopy and SVOne refraction as compared to subjective refraction. The table shows that for sphere, retinoscopy and SVOne show the same limit of agreement. Also, this finding shows that SVOne sphere measurements have variability similar to that of subjective refraction between clinicians as previously reported. The SVOne measurements for cylinder and axis were a bit more variable than retinoscopy, but as the authors concluded that could be due to alignment error, something that has been addressed by the introduction of a stand to which the instrument can be attached to, thus virtually eliminating misalignment errors and contamination of cylinder and axis measurements. The next table above shows repeatability data of 10 subjects. The data shows that SVOne refraction had higher repeatability than subjective refraction. This finding is again consistent with previous reports by Bullimore et al. showing that automated refraction is more repeatable than subjective. The adult study was very strong but clinically we also needed to test the accuracy of the device on the majority of the population. A study was conducted to test how well the device performs within the pediatric population. Conducted by Rosenfeld et al., the study showed that SVOne refraction is also accurate in children and has higher repeatability than subjective refraction. The study was conducted using 40 normal children age 5 to 17, all correctable to normal vision. The study followed the same design as the adult study. The table above shows the values calculated for the 95% LOA in diopters for retinoscopy from SVOne refraction as compared to subjective refraction. The data shows that while sphere measurements using retinoscopy were a little bit more accurate, SVOne refraction varied by only additional +/-0.2 D, less than a quarter of a diopter. And both methods showed the same LOA for cylinder and axis. The next table above shows repeatability data of 5 subjects. The data shows that the SVOne has the highest repeatability across all components of the refraction, sphere, cylinder and axis. The study confirmed that the SVOne is an accurate and repeatable way to measure refractive error in children. SVOne Refraction: The New Gold Standard? Through clinical studies and the feedback and results from doctors using the SVOne, we were able to conclude that automated refraction and the SVOne are certainly challenging the gold standard of subjective refraction due to the accuracy and repeatability of refraction results. SVOne technology is a practical approach to solve the challenge when subjective refraction is too costly or unavailable. If you are running multiple optical retail stores, and have difficulties to capture walk-in customers due to lack to ability to provide on-site vision exams. SVOne is the perfect solution to provide fast and accurate eyewear prescriptions to your customers. If you are running a mobile clinic, and conducting manual refraction is too cumbersome, SVOne is the solution to provide clinically proven vision care to your customers. If you are running an overseas mission trip, and facing thousands of patients in the duration of a few days, SVOne is the portable solution that can offer efficient vision exams in a big way. If interested in learning more about the SVOne autorefractor, request a demo to see the refraction process. We recently held a webinar on how an advanced autorefractor can grow your business. Smart Vision Labs’ CEO and inventor of the SVOne technology, Yaopeng Zhou, touched upon a range of topics from the facets of the technology itself, to the sectors where portable autorefractorsare being used and the results that have been seen in those very sectors. Whether being used in a mobile optometry practice, optical retail store, mission service trip, or even in determining the next best Major League Baseball player, our advanced, portable autorefractor has helped our partners achieve excellent results for themselves and for their patients. Below are some highlights from the webinar to help take your practice or retail operation to a whole new level. The inspiration for Smart Vision Labs started out 4 years ago when I read an article saying there are over a billion people around the globe who suffer from uncorrected vision. Back then there were two reasons for that: number one was due to the lack of access to eye care professionals, and number two was that the existing technology was often too bulky and expensive. So the inspiration was to build something I could put in my pocket that anyone could easily use. Fast forward 4 years, here we are with our latest device release. And the story behind the device is pretty interesting from an engineer and designer perspective. Our old initial design in counter with market feedback taught us a lot. That’s why in the last 3 years we’ve launched 3 generations of autorefractors. We received a ton of feedback from the market as well as from the over 500 doctors using our device. This feedback is what led to the release of this current generation. The biggest change with the current generation is with the physical appearance and, specifically, the stand we now use that dealt with some issues our partners’ were encountering with alignment. The first generation was a handheld device, and we noticed subtle differences depending on who was administering the exam due to how they were holding it and the overall differences in hand stability. When measuring sub micron level precision, every little thing matters. So we took what we learned from market feedback and put it an adjustable, physical stand to stabilize the measurement process. We also optimized the software. I would say no more than 30 to 45 minutes to train someone on using the device. And I wouldn’t even call it training, I would call it guidance and just becoming familiar with the process. It’s really digging into the wavefront technology. This autorefractor is powerful and we were able to create something so powerful while also figuring out a way to shrink down the technology to something ten times smaller than anything else in the market. We can provide a customized prescription for everyone beyond sphere cylinder. We want to give people vision even better than 20/20. The future is using a device like this to match the digital technology on the lens manufacturing side and then ensuring that everyone has an exact pair of glasses which meet their specific needs. For a normal person like you and I, 20/20 vision is probably okay. But when you’re looking at a more high-end market, maybe people would want to pay extra money to have better than 20/20 vision. From military professionals to sports leagues, there are so many markets where having vision better that 20/20 is really important. So this clinical study was conducted last year during the spring training season with 5 MLB teams and over 600 players. We discovered that they have 20/12 vision much higher than the average person and even approaching levels or “superhuman eyesight.” In baseball, any refractive error is detrimental. Players need to be able to capitalize on any potential advantage, such as correction of refractive errors. We found that with our refraction technology, MLB players have 0.22 diopter sphere and less than 1/10 diopter cylinder. Most eyeglasses typically won’t even correct that. So I was blown away at how our technology can detect something that a normal lens wouldn’t correct. With a pediatric market, the most important thing is accommodation. So the question with this market is how do you develop a technology with truly relaxing accommodation power? Well, that’s exactly what we did. Our autorefractor relaxes the patient through the ease of its technology. And that combined with the accuracy of the wavefront technology creates a tool that can successfully detect young people’s refractive error. As for the peer reviewed clinical study, we conducted on healthy adults ages 18 to 35, we found similar results in accuracy. We were able to successfully prove the correlation between our device results and manifest refraction result and were able to detect a correlation coefficient of 0.97. That’s an insanely good number and we’re truly very proud of this technology. Not to mention this was done 3 years ago with our original technology which has only improved since then. I would have to say the Major League Baseball study. I wouldn’t necessarily say I was surprised, but I was definitely amazed by it. We shipped a device to Florida and someone who had never used our technology was able to get highly accurate results. It’s truly an indication of the device’s impressive user experience. Any doctor, or even any person for that matter, can pick this device up and get results similar to those in our clinical studies. Well for doctors efficiency is key. They see tons of patients and every minute they’re able to save can translate to an economic benefit. With technology like this, they can do an exam right in the waiting room in just minutes without even needing to bring the patient into another room. Additionally, the technology is mobile so you can bring it anywhere. The device itself weighs about 1 lb. There is some added weight because of the stand, but you can also buy a commercial tripod to place the device onto. It’s very easy to move around and with this technology, you can essentially carry your practice with you in a bag. That was unimaginable even 5 years ago. What’s also great about this is that doctors with busy practices who have patients coming in for different needs are now able to direct patients based upon those needs in a more efficient way. It’s sort of like triaging. If they only require a vision exam, the doctor can now do that quickly and devote more time to patients in need of more comprehensive care. This autorefractor allows doctors to be the champion of efficiency through optimizing their workflow by sending patients to different areas of specialties based on their needs. There are multiple different scenarios on how doctors could get involved in telemedicine. For the doctor who travels a lot but wants to be able to keep the clinic or practice open while he’s traveling, he’s now able to do that. It really depends on how much they want to get involved and the extent at which they want to incorporate telemedicine into their practice. I’ve seen doctors wanting to help other optical retail locations in their free time that are now able to do that. Regardless of their desired level of involvement, telemedicine allows for a lot more flexibility. We’re in an age of cutting edge technology with a lot of new advances constantly occurring. My advice would be to immerse yourself in learning about these technologies in person to get a sense of what they’re all about. These new technologies might become the status quo and you definitely don’t want to be left behind. You want to acquire all the knowledge – even the knowledge beyond the schools – to incorporate into your practice. We’ll be at Vision Expo West in Las Vegas, September 13-16, 2017 if you want to come see the technology in person, go through the exam, and just play around with it. You can see (video below) once the eye appears in front of the camera, the software is automatically triggering the camera to take a picture without even touching the screen. It takes 3 images per eye and the results appear right away, even faster than the previous generation. The device really is hands-free. This sort of experience was not available before in the medical device industry. So we decided to combine an easy to use consumer experience with a very sophisticated medical device. It’s something that we’re really proud of. Generally speaking, it was probably just with the learning process of it all. We launched our first product 3 years ago and I thought to myself, “Okay that’s it! I figured it out, this is the ending product.” But I quickly realized that it’s a process that involves a lot of learning. People give you suggestions, you get feedback from the market, and you then make the product better. I didn’t initially realize how much the product would develop. I would have to say I would’ve had better communication from day one. I’m not a medical doctor and I don’t think we communicated with optometrists and ophthalmologists enough. When we entered this industry, we had a mission as tech guys to solve a real problem. So I would have had better communication with ODs and MDs to tell them what we want to accomplish. It’s something that really would’ve helped us along the way. An advanced autorefractor, and specifically the SVOne, has substantially helped grow optometry practices and optical retail stores. Its portability, affordability, and clinically proven accuracy makes the SVOne an excellent addition to any practice or retail operation. If you’re interested in learning more about the SVOne autorefractor, request a demo for a more in-depth understanding of how the device works. When it comes to conducting vision exams, and specifically measuring just how much your patients’ eyes need to be corrected, an autorefractor is the optimal tool to measure the refractive error of the eye. There are many autorefractors on the market to choose from. But when considering the different purchasing options, it’s vital to decide which direction you would like to take your optometry practice and consider which attributes of an autorefractor allow you to move in that direction. The measurements taken by all autorefractors can translate into a prescription for eyeglasses or for contact lenses. But the SVOne autorefractor has a unique set of features that differ from the average desktop autorefractor. And why settle for just average? The technology of the SVOne is a Shack-Hartmann wavefront sensor, allowing you to view spotfield readout in real time. These types of sensors have the ability to measure a very wide range or local wavefront inclinations. This level of wavefront distortion is not typically accessible through other technologies. This is not your average autorefractor. Physically speaking, the SVOne autorefractor can either be handheld or mounted on a height-adjustable stand. And for all you budding photographers/videographers, it is even compatible with a commercially available tripod. The SVOne autorefractor is perfect for the mobile optometry practice, or even for convenient mobility around an optical store or optometry practice. Its versatility makes it an excellent purchase. The device itself has hands-free alignment, driven by a machine learning algorithm. The patient no longer needs to be seated with their chin in a stabilizing chin rest, as the machine will stabilize the image itself. Those clunky autorefractors in the dark optometrist’s office are pretty outdated. Don’t be afraid to try the new, innovative technologies. All the “cool kids” are doing it. The SVOne weighs approximately 1 lb (454 g). Its lightweight feature makes it highly portable for the mobile optometry practice. It’s also perfect for that person who might skip the gym visit a little too often – even they will have no problem carrying this portable autorefractor. Remember the days where all medical records were stored in file cabinets? Well, I don’t, I was barely alive for those days. But anyways, they are now long gone. This autorefractor has the ability to store up to 4,000 saved refractions right on the device and has unlimited refraction data storage in the cloud. And don’t worry about privacy and security, Smart Vision Labs is HIPAA compliant. If you’re still the old-fashioned “I like a hard-copy of my records” kind of person, we have an option for you too. The SVOne autorefractor can connect to any AirPlay printer to print exam results. We have iPhone technologies to thank for that one. In case you haven’t noticed, we’re all about speed and convenience. The vision exam itself is remarkably quick. And specifically, the data acquisition time is about 3 seconds per eye, and the autorefractor measures and averages 3 readings per eye. The results come in, figuratively speaking, in a blink of an eye. And if you’re still skeptical, we have three clinical studies to prove the SVOne autorefractor accuracy. With the help of the SUNY College of Optometry and the Sports and Performance Vision Center, we were able to test the accuracy of this autorefractor in a population of MLB players, a general adult population, and a pediatric population. All three clinical studies concluded that the SVOne is well-equipped to measure a refractive index. Lastly, if we still haven’t convinced you yet, we’ll play into your potential patriotic nature. All of our autorefractors are manufactured in the United States. So when returning to your optometry or retail operation with an SVOne, you can pride yourself on knowing that you gave your business to manufacturers on your very own soil. If these attributes are anything your optical store or optometry practice is looking for in an autorefractor, request a demo of the SVOne to further see why this device is the perfect option for you. Issy Bonebrake is a born-again New Yorker living down in the Village. She considers herself to be a self-proclaimed, cautiously optimistic futurist. As a classic rock aficionado, she enjoys binge watching rockumentaries from the coziness of her less than 500 square footage apartment. According to the WHO, 246 million people around the world have low vision. 90% of those people happen to live in developing nations and in other low-income situations. Now absorb another statistic: 700 million people around the world do not have access to vision care. Now, what if there was a technology to continuously reduce that number? Since you are on this page, I think you already know the answer. The wavefront technology behind the Smart Vision Labs portable autorefractor has actually existed for a while now. However, it has never been easier to prescribe people, and practice eye care, thanks to our compact and lightweight optometry equipment. We have essentially enabled optometrists and doctors to go beyond the clinical practice. The following are some situations where our technology has been utilized. The first one is obvious. Our partner optometrists have done amazing things using our technology. Our partners attribute their purchase decisions to the accuracy, efficiency, speed, portability, and affordability of our product. They applaud how it has streamlined the refraction process while producing accurate objective refraction data. Owning an optical store in this day and age is far from easy. Because of advances in technology and stiff competition from innovative retail shops, the independent optical store owner is under constant pressure to keep up with the times. Portable autorefractors have provided an innovative competitive edge for optical store owners. From an improved capture rate to less of a wait time, to increased patient throughput, this particular piece of optometry equipment has disrupted an industry that has had the same technology since the late 19th century. According to Fast Company, corporate wellness programs are currently an $8 billion industry in the U.S. and are expected to grow by 7.8% through 2021. Such a lucrative industry is ripe for opportunities, and portable medical technology has been at the center of this industry. Portable autorefractors are one of the ways in which corporate wellness companies can expand their services and take a bigger slice of the pie. Our portable autorefractor has been used at corporate wellness programs. We have joined forces with some of our partners to conduct vision exams in many corporations including Spotify, Oscar Insurance, Compass, Pager, NYU, and more. Quoting from one of our clients, “All of the feedback we received was positive and many employees were appreciative of the convenience of being able to receive an eye exam in the office”. Doctor and optical store owner, who have an interest in this market, should look to take advantage of the opportunity by incorporating the Smart Vision Labs portable autorefractor. Portable Optometry equipment has always been a core part of eye care mission trips, and a big part of Smart Vision Labs philanthropic ambitions. Whether it be phoropters, tonometers, or autorefractors; mission trips and portable technology go hand in hand. Portable autorefractors have carved out their unique niche in this sector and there is no better feeling than being able to serve more people around the world. The same goes for schools screenings and assisted living medical visits. We conducted vision tests in schools and were beyond inspired by the way our results lit up the faces of those school children. In a recent article, we talk about how important this time is for optometrist as the back to school rush is about to begin. Often the people administering vision tests in schools are not trained professionals and our autorefractors can reduce the margin of error by providing the most accurate objective data so students can concentrate on learning. The US Armed Forces have many health requirements including good vision. The same parallels for good vision also spill over to law enforcement where vision testing is a requirement during the recruitment process. The armed forces also go on humanitarian trips to test vision and do health check-ups where portable autorefractors are commonplace. The Navy, for example, has optometrists who go on mission trips during their service to conduct vision testing. Believe it or not, prisons are another place where portable autorefractors have the potential for doctors to increase their business (or improve their practices). One of the things prisoners retain is the right to healthcare. Yet somehow, there is an increasing demand for optometrists in prisons. The Smart Vision Labs portable autorefractor fits perfectly as a complement equipment for optometrists when they go to correctional facilities to conduct vision testing. The speed and accuracy are perfect for situations where you want to be in and out and not spend too much time doing the refraction or rechecking to determine if the results are accurate are not. Vision tests are becoming the norm in many sports all over the world. We recently released a clinical study on the “elite” vision of professional baseball players. In the professional leagues, hitting a pitched baseball has been described as one of the most difficult tasks in any sport. Baseball players, on the other hand, have shown to have visual acuity approaching 20/12 (20/8 is often considered to be the best humanly possible vision). With the help of ophthalmologist Dr. Daniel Laby and the SUNY College of Optometry, we conducted a study to prove our hypotheses. During the 2016 Spring Training Season, Dr. Laby tested over 600 MLB players using our handheld wavefront autorefractor, the SVOne. The results of the study showed that the SVOne autorefraction system can successfully measure the small, yet significant, refractive errors in the sample of players that were tested. Apart from baseball, studies have also been done that link the vision of soccer players to their performance. Imagine the applications of portable autorefractors when it comes to sports like tennis or hockey, where the target object of concern is as small as a baseball. Take a look at the study to learn more about the applications of mobile optometry equipment in sports. Mobile and digital healthcare have come a long way to improve the health and living conditions of people in rural America. Imagine living in rural South Carolina where there is only one optometrist for a few thousand people in an area of a few hundred miles. To make your job easier, more efficient, and your practice more profitable, why would you not get portable Optometry equipment for your practice? Whether you have a clinic or a mobile optometry practice, a portable autorefractor like the SVOne can take your business to a whole new level. As you can see, portable autorefractors and especially the Smart Vision Labs Wavefront Autorefractor, open up opportunities to grow your practice beyond a traditional brick and mortar clinic. This technology truly has the potential to serve the vision care needs of people all over the world, and bring vision care to the most remote areas of this world. We hope you are as inspired and motivated as we are to make vision impairment obsolete. The modern optometry practice is one that has the latest technological advancements, provides the best quality service, and produces a very convenient customer experience at an affordable price. No matter how many lanes you have in your practice, it all boils down to the doctor and the equipment the doctor utilizes. The doctor is hard to change and if you are not a customer centric doctor, then you will need to rethink your strategy. The equipment, however, will provide the best doctors with an increased ability to do an even better job further setting them apart from their competition. Here are the essential tools that your optometry practice could be use to achieve a higher threshold of success. A digital VA chart is a very popular equipment in contemporary optometry practices and optical stores all over the U.S., and there is good reason why. A comprehensive digital VA chart squeezes in a lot of features and vastly diminishes the footprint in your business, with some even going as far as featuring a lens clarity visualizer tool. A good digital VA chart system will, along with a standard Snellen chart, allow you to randomize the letters, provide charts for different clinical situations including astigmatism, ETDRS, and even the ability to input the distance in between the patient and the screen. A tonometer conducts eye pressure tests, but to the average person, this machine essentially is the one that blows the puff of air into their eyes. Optometrists, on the other hand, know how crucial this piece of equipment is. Tonometers have come a long way from the days of a schiotz tonometer. There are tonopens, which are the closest in terms of its reminiscence to a schiotz tonometer, an affordable option if you are looking to invest less capital for equipment. Along with that you also have the non-contact tonometers where the person rests their face for the procedure. Whatever equipment you decide to buy, this is essential for any optometry practice. Breaking it down simply, fundus photography equipment is used to take pictures of the inside of your eyes. Colloquially called a fundus camera, these imaging pieces of equipment are common for most ophthalmic equipment manufacturers and they usually take up a big footprint in your office because of the desktop based design of the equipment. However, in recent years a variety of inexpensive equipment options have come out. Ones that can be attached to a high-resolution digital camera or a camera in a smartphone for the retinal imaging. Although, the efficacy and accuracy of these more inexpensive alternatives are still debated. Optical Coherence Tomography (OCT) equipment is what is used for taking images of the retina. The advantage of this equipment is you can really dig deep into what problems the eyes can be having and even detect the early onset of various eye diseases and conditions. This is one piece of equipment that should be there in your practice if you decide to expand the medical scope of your practice. An autorefractor is the optimal tool to measure the refractive index of the eye. Whether you have a full fledged practice with the most cutting edge ophthalmic instruments or a mobile optometry clinic, an autorefractor will ensure the most convenient customer service while maintaining a superlative standard of care. The best way to go is to purchase a handheld autorefractor. The Smart Vision Labs wavefront autorefractor is currently the most affordable and portable piece of optometry equipment, and there are clinical studies to validate the efficacy of the equipment on a variety of ages and populations. An autorefractor is the best addition to have in your lane, along with your phoropter, because of the rapid throughput it provides. With the Smart Vision Labs autorefractor expect rapid results with incredible accuracy. As your practice grows over time, you will be adding equipment slowly. An investment in the equipment becomes more than just a capital investment as it aids in providing a better user experience for the customer. A combination of these pieces of equipment will certainly make your practice stand out. For both parents and children, back-to-school season can be a bittersweet time of the year. Those peaceful end of July/August evenings blissfully leads you into the start of a brand new school year. But unfortunately, before you know it the first day of school is suddenly this upcoming Monday. How did that happen? You’ve been sitting around watching the news on Sunday evenings only to be interrupted every 15 minutes by a Staples or Target advert reminding you to get your back-to-school shopping done while the sales still last. And on top of that you’ve been receiving bi-weekly letters from your children’s schools reminding you to get them to the doctor’s office for their yearly physicals, dental checkups, and – most importantly, of course – their vision exams, so nothing will stand in the way of their learning. But did you actually remember to do any of that yet? Well, if you’re anything like my parents were, chances are you didn’t and the last weekday before the start of the school year is a chaos-ridden extravaganza, consisting of having just about every back-to-school errand known to mankind to do in just that one day. But what if I were to tell you that you could enjoy the end of your summer, and still get at least one of those tasks – obviously the most important one – checked off your to-do list? (Hint: it’s the vision exam – big surprise there). With the Smart Vision Exam, anyone from the ages of 12 to 65 can get their vision tested in as little as 5 minutes. With no appointment necessary, that maximum 10-minute trip to a Smart Vision Exam site will not cut into any of the time reserved for impatiently waiting for your daughter to make the life-or-death decision over which set of highlighters to buy at Staples. Super important stuff. So with that quick and convenient trip for a vision screening, you will then receive an updated prescription in as little as 24 hours. Might as well even get one for yourself while you’re at it. Many schools offer in-school vision screenings at the start of the year, the ones I attended included. But often times, the person administering the exam – typically the school nurse – is not a trained professional. The margin of error on an improper vision exam consisting of just reading a snellen chart is remarkably high. This type of in-school screening is in no way a sufficient alternative for a proper vision exam, as in most cases, the person administering the test is not well-equipped to detect the patient’s refractive error. Full disclosure: I went to public school in the early 2000s and perhaps this is just commentary on the fact that my school nurse was one of my classmate’s unqualified grandmothers who had a little too much free-time to offer up. Regardless, I passed the in-school screenings with flying colors. It wasn’t until I received a proper vision exam that I realized I had been walking around for years with a -1.50 error in both eyes. Thanks, Nurse Janet. At developing ages where eyesight is likely to change frequently, getting your vision checked is especially crucial. With the help of Dr. Mark Rosenfield and the SUNY College of Optometry, we conducted a clinical study to test our SVOne autorefractor in its ability to measure refractive error in a pediatric population. The results concluded that the device is more than capable of doing so, and might even be a better option for pediatric patients. The American Academy of Pediatrics, as well as other ophthalmological organizations, recommend a handheld autorefractor for measuring such error as, “it is quick, requires minimal cooperation from the child and is especially useful in the preverbal, preliterate, or developmentally delayed child.” The clinical study also reiterates that given that most in-school screenings are performed by school nurses and/or volunteers untrained to perform retinoscopy, handheld autorefraction can be a very valuable and important asset to ensure proper exam results. You don’t say. Aside from the benefits of accurate vision-screening results, the Smart Vision Exam is perfectly suited for the reluctant-to-go-to-the-doctor’s-office type of child. Another full disclosure: I was that child. Upon my first trip to the optometrist for a proper vision-screening and eye exam, the dilating eye drops, the puff of air test for eye pressure, and even just the overall extremity of the machines in the optometrist’s office gave me some substantial anxiety. And, as is the case for many healthy children, I had no signs pointing towards eye disease and left the office – with remarkably dilated pupils, I might add – only having needed a pair of glasses. The American Academy of Ophthalmology claims that in the young adult, the rate of development for significant eye disease is very low until the age of 40, at which it then begins to steadily increase. Additionally, they recommend only one comprehensive medical eye exam at some point before reaching the age of 40. A routine comprehensive exam under that age unnecessarily escalates the cost of eye care, when a simple vision screening will more than suffice. So if stuck with an “I refuse to go the doctor” type of child, consider just simply visiting an optical store carrying the Smart Vision Exam, where they will be tested by a device that looks like a glorified iPhone, be in and out in about 5-10 minutes, and you’ll be free of that obligation for a guilt-ridden trip to the ice cream parlor after a doctor’s appointment. Not to mention it’s substantially cheaper than a comprehensive eye exam. Seems like a rather obvious decision. Before you know it, summer is going to be over, school will resume, and morning commutes to work are going to hampered by yellow school buses’ and their impressive ability to always drive well below the speed limit. Back-to-school errands are already stressful and time-consuming enough. Let the Smart Vision Exam facilitate at least just one of those. Amidst that back-to-school craze, don’t brush aside the importance of vision testing. With our exam, you’ll have plenty of time left to enjoy your last summer days. And if you’re lucky, you might even save yourself some more time for that coveted errand of school-supply shopping. Issy Bonebrake is a born-again New Yorker living down in the Village. She considers herself to be a self-proclaimed, cautiously optimistic futurist. As a classic rock aficionado, she enjoys binge watching rockumentaries from the coziness of her less than 500 square footage apartment. Issy was 8 years old when she realized the remarkable incompetence of in-school vision screenings. In the professional leagues, hitting a pitched baseball has been described as one of the most difficult tasks in any sport. A baseball, barely 3 inches in diameter, is pitched at speeds over 90 mph, taking less than half a second to reach the plate. And in that time, the batter must judge the pitched ball and decide if and when to swing, in just milliseconds. It’s not difficult to understand that remarkable level of difficulty. Think about that next time you’re arguing that the Cubs only won the 2016 World Series because of the rain delay. Generally speaking, baseball players can see with substantially more precision than the average human, with an extraordinary ability to focus on an object. Normal vision for the average person is typically described as being 20/20. Baseball players, on the other hand, have shown to have visual acuity approaching 20/12 (20/8 is often considered to be the best humanly possible vision). Elite vision clearly indicates a profound ability to quickly judge how to successfully hit a pitched ball. Maybe this can shed some light on why Michael Jordan, arguably one of the best athletes of all time, for the life of him could not successfully hit a baseball. So to those of you normal 20/20-vision people, with the “baseball’s the most boring sport to watch” and the “baseball requires little athleticism” comments, get out and try to hit a professionally-pitched ball before judging a player for whiffing one of Corey Kluber’s pitches. The results of the exam did conclude, in fact, that baseball players tend to have visual acuity around 20/12, meaning that a baseball player can see from 20 feet away what the average person can see from only 12. And for those demonstrating slight refractive error, if left uncorrected, it could decrease vision to at least 20/20, likely making them inadequate at batting at a similar level to most MLB players. But I’m not saying that almost all baseball players naturally have vision better than 20/20. In fact, Laby estimates that up to 20% of MLB players wear corrective lenses when playing. And players with 20/20 vision are increasingly wearing lenses to achieve this level of elite vision that so many of their teammates naturally have. So imagine when scouting players, you can use Smart Vision Labs’ portable autorefractor to conduct vision tests. You potentially might find that a player with tremendous potential has a slight refractive error, and given even the slightest correction, it could be the difference between this rookie batting an average of .260 versus a .300. Only about 5% of minor league players end up making it to the major leagues. By being able to accurately detect any slight refractive error and subsequently correct for that error, players are then competing for the few major-league spots on an even playing field. And even if you still don’t end up making it – just blame it on your subpar, natural 20/20 vision. Or maybe even use that “rain delay” excuse. Like I said, hitting a baseball requires being able to judge the rotation of the ball – coming at you around 90 mph – standing 60.5 feet away. In the milliseconds it takes to reach the plate, the batter has to process what he sees and then decide how to effectively swing. The quicker the batter can identify the type of pitch thrown, the more time they have to prepare for their swing – hitting earlier on a fastball and later on a curveball. It shouldn’t be much of a surprise that it just might help to be able to see as best as humanly possible. Some MLB players have vision better than 20/12. Take Red Sox second-baseman Dustin Pedroia, for example. In his book, he wrote that his vision is “something like 20/10” – although that’s really not much of a surprise. And as if people don’t already love to gather ammunition about Yankees players, retired player Kevin Youkilis has been said to have 20/11 vision. Evidently, above-average visual acuity is essential to succeed in baseball. So whether you’re a major-leaguer looking to improve your batting average, a minor-leaguer looking to land one of those few major league spots, or maybe you’re just someone hoping for a career in professional sports, why not ensure you’re giving yourself the best chances at successfully hitting a ball and, on a larger scale, improving your overall hand-eye coordination? With the SVL exam, you can check for these potentially minor refractive errors and subsequently correct for them. And who knows, with this newly corrected, elite vision, maybe the Indians will – after almost 70 years – finally again win the World Series. Issy Bonebrake is a born-again New Yorker living down in the Village. She considers herself to be a self-proclaimed, cautiously optimistic futurist. As a classic rock aficionado, she enjoys binge watching rockumentaries from the coziness of her less than 500 square footage apartment. Ironically, Issy is a Cleveland Indians fan and actively asserts that the 10th inning rain delay is why they lost the 2016 World Series.